It wouldn’t be surprising to find out Lionel Messi has made himself quite a few enemies during his career, as the case of Raul Baena refusing to shake the Barcelona star’s hand before the match against Rayo Vallecano raises a few more questions about how Messi is like behind the scenes. The facts? Baena played alongside Messi in the Barcelona youth system, but left the club in 2007 to join Espanyol, as quite a few players do once they’re supposed to join the senior team but aren’t good enough. Baena is slightly younger than Messi, but had time to be around him as the two were making their way up to the senior team. The other fact? The two didn’t shake hands before the match in Madrid, which Barcelona won 4-0. Messi did have his hand open for the shake, but it seemed Baene retracted his after making a gesture of being willing to shake it. Messi doesn’t even look in Baena’s direction, so maybe there’s a bit more to it. 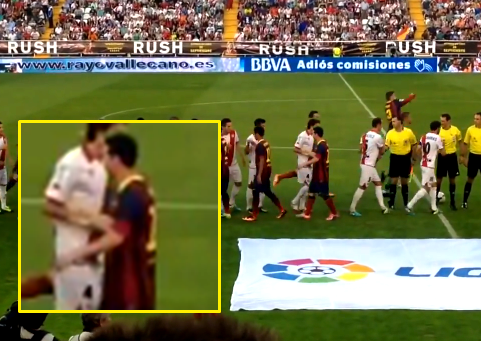 According to Baena, this is an issue that I would like to clarify, because in the many reports it has been assumed that it was me who refused to greet Messi. They were the visitors and were passing us by for the greeting. You can clearly see that there is hint from me to shake hands, in seeing him pass by, I retract mine. So is it Messi that doesn’t want to shake his hand? Maybe he just didn’t notice him, but those moments are so rare, and behind each non-shake usually comes a story. Maybe it has to do with Baena playing for Espanyol over the last few years, or maybe it has something to do with something in their past from Barcelona, although such an incident never occurred in the Barcelona derbies while Baena was there. During the match, Baena was booked for a foul on Messi, although it wasn’t anything malicious or out of the ordinary, and didn’t seem to affect anyone in particular during the match. Messi himself didn’t score a goal for the first time this season, leaving the work and credit to Pedro with a hat trick while Cesc Fabregas added a fourth.